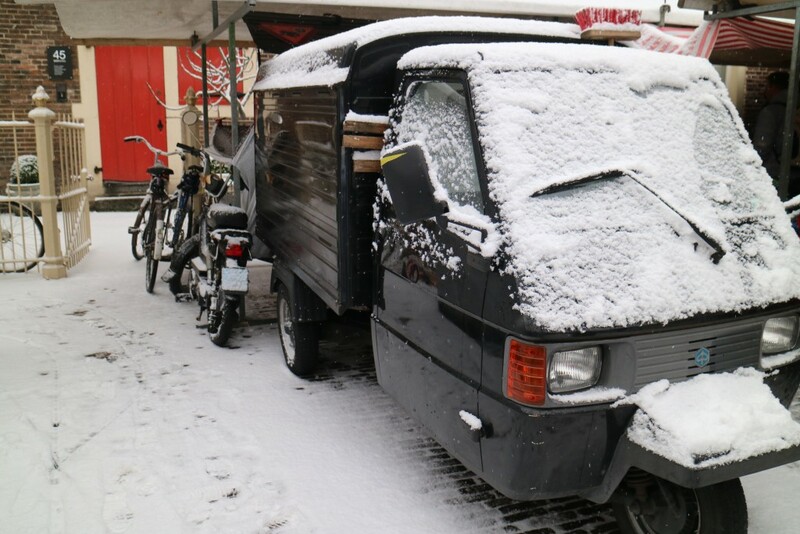 A few weekends back Amsterdam suddenly turned into a winter wonderland, all in 1 night! I woke up in a white magical world on Saturday morning and all I wanted to do was go outside. 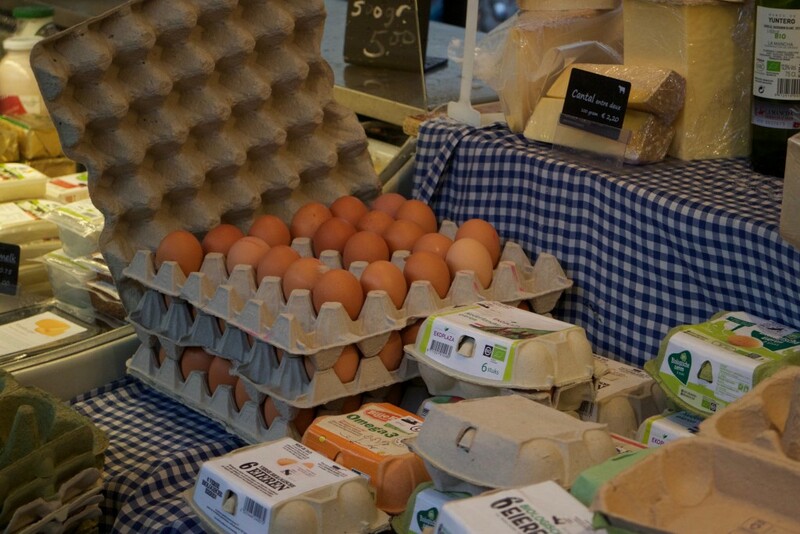 And that was a good idea because Saturdays are well known for markets. 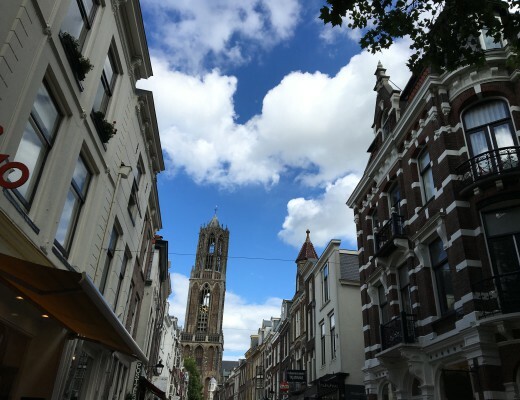 So we went to the Noordermarkt, one of Amsterdam’s best markets in the Jordaan neighbourhood, situated in front of the pretty Noorderkerk (Noorderchurch). 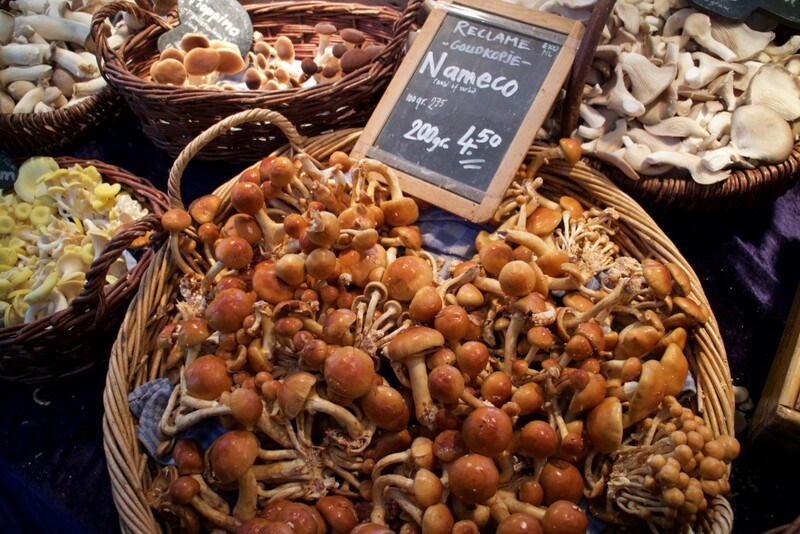 Market day in Amsterdam! 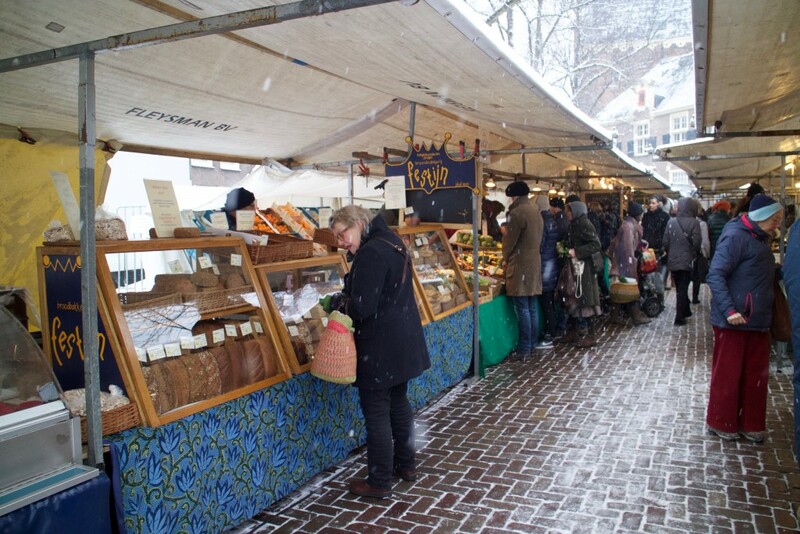 Summer or winter; people come to Noordermarkt for the excellent organic products. Snow! 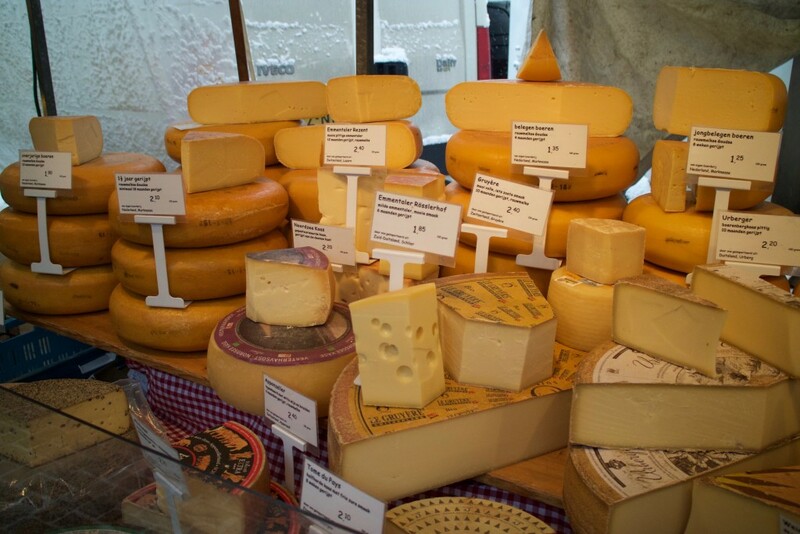 One cannot be on a Dutch farm market without trying some Dutch cheese. 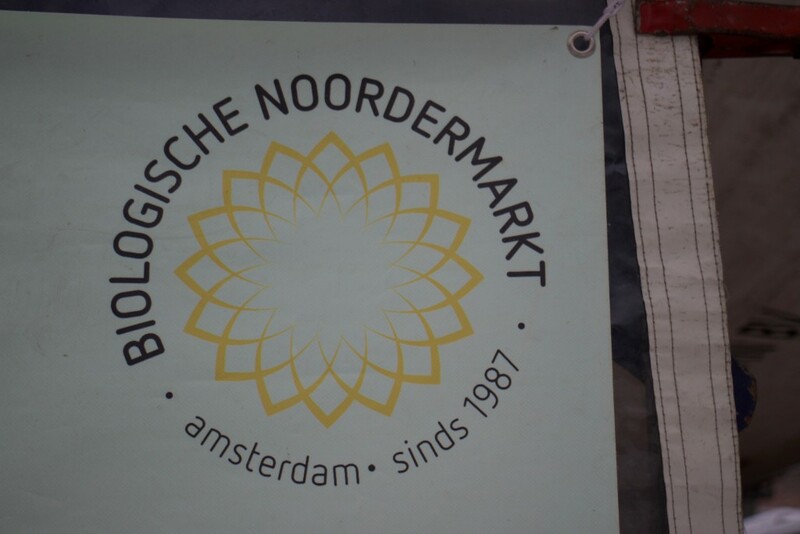 Organic Noordermarkt Amsterdam, since 1987. 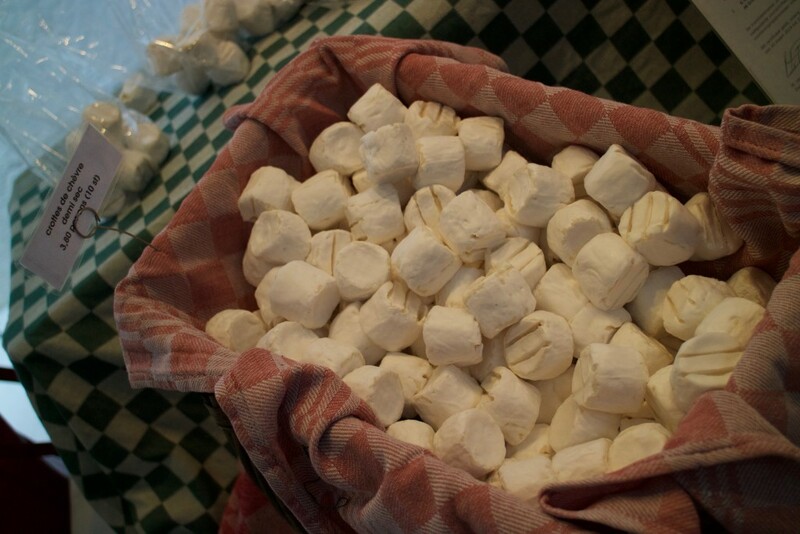 Grottes de chèvre! Lousy translated as goat droppings, because of the shape of this delicious goat’s cheese. 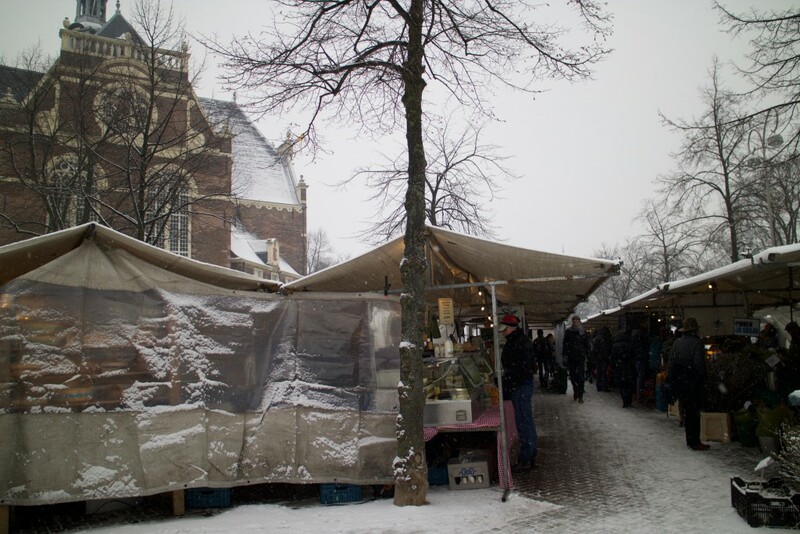 Noordermarkt is situated on the junction of the Prinsengracht canal and the Westerstraat. 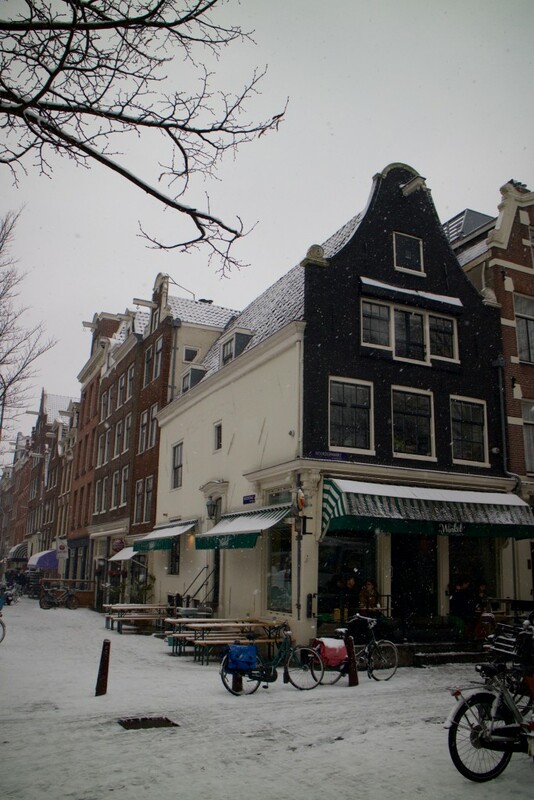 On the left photo you see Winkel 43, a building on the corner of Westerstraat and Noordermarkt where they serve the best apple pie in Amsterdam. It’s a good place to have coffee and pie (or lunch) after you visited the Noordermarkt! 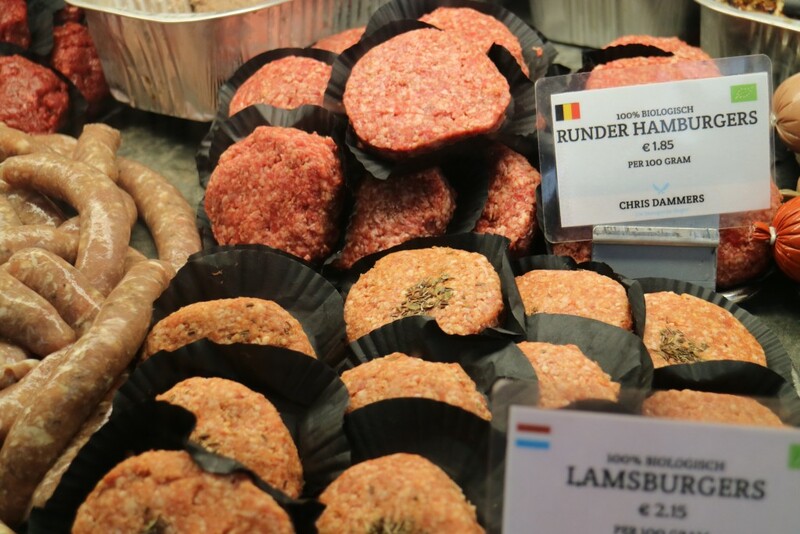 On the left photo you see the delicious dry sausage from the butcher at Noordermarkt. 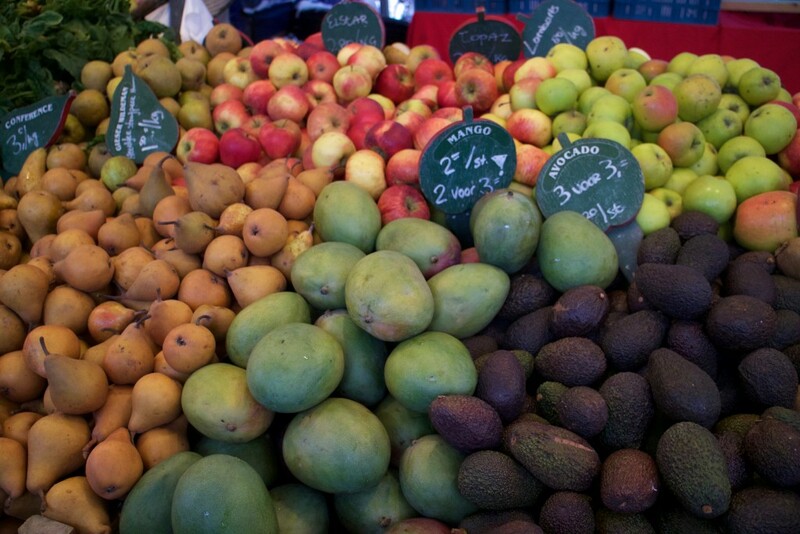 ….and fruit! 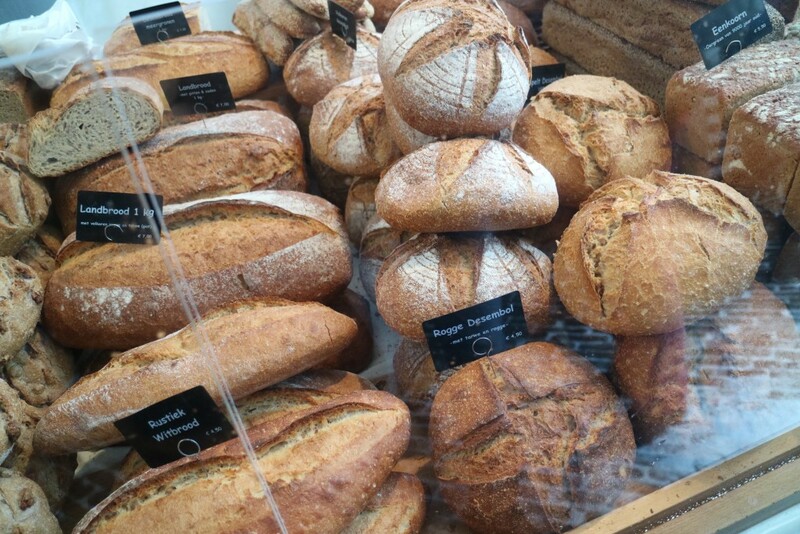 Delicious organic bread from Le Perron bakery. 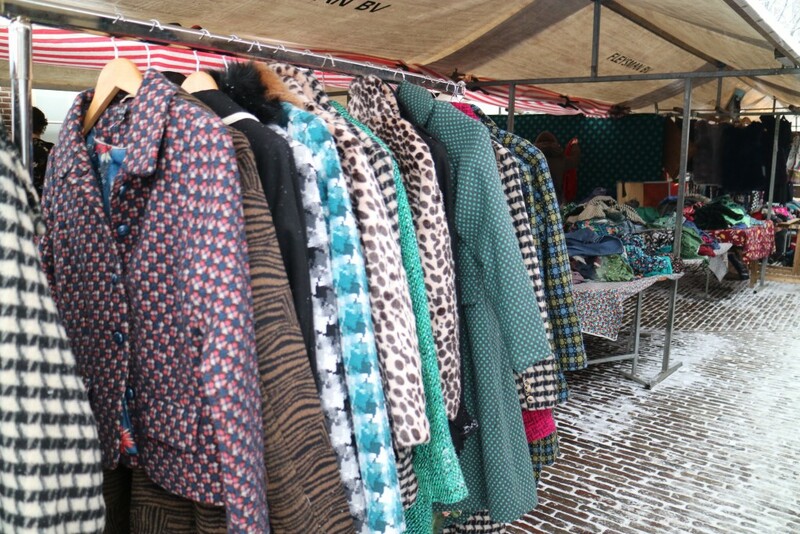 Vintage second hand clothing, organic meat from the butcher, honey products (like candles and soap) and a stand full of all kinds of (wild) mushrooms! 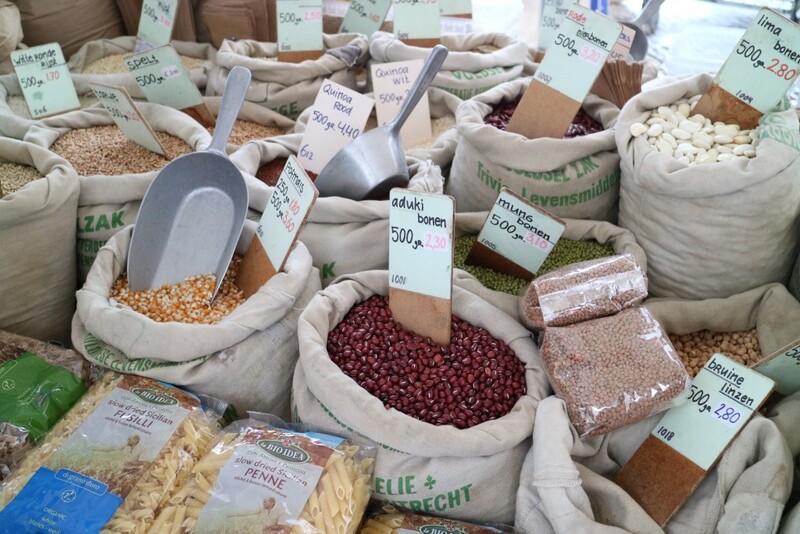 aduki beans, lima beams, quinoa, spelt, lentils, wholemeal pasta and more. 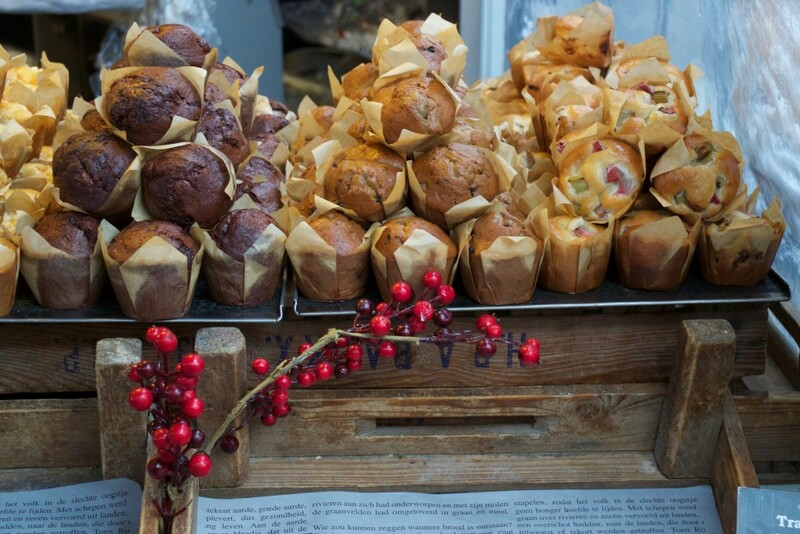 The muffins at Le Perron bakery stand are very tasty: wet, full of flavour, real fruit and a bit soggy and sticky; just like a muffin has to be. All but not dry. 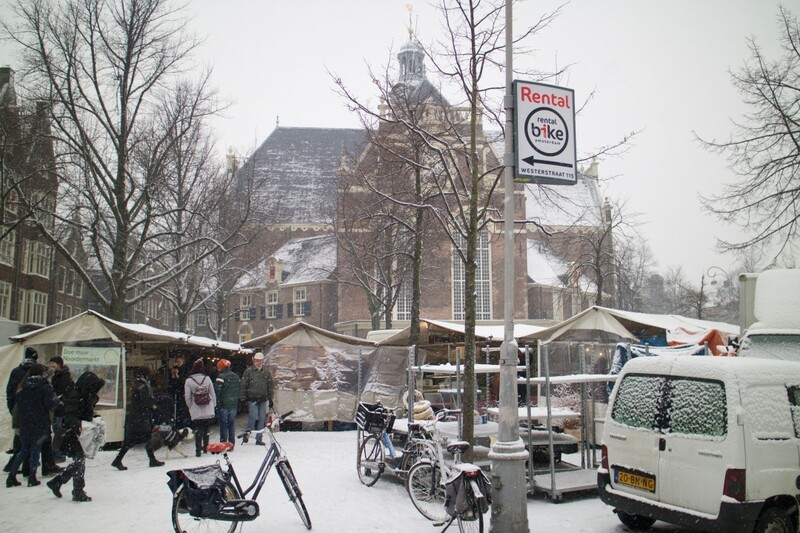 Snow on the Noordermarkt of Amsterdam. I like! 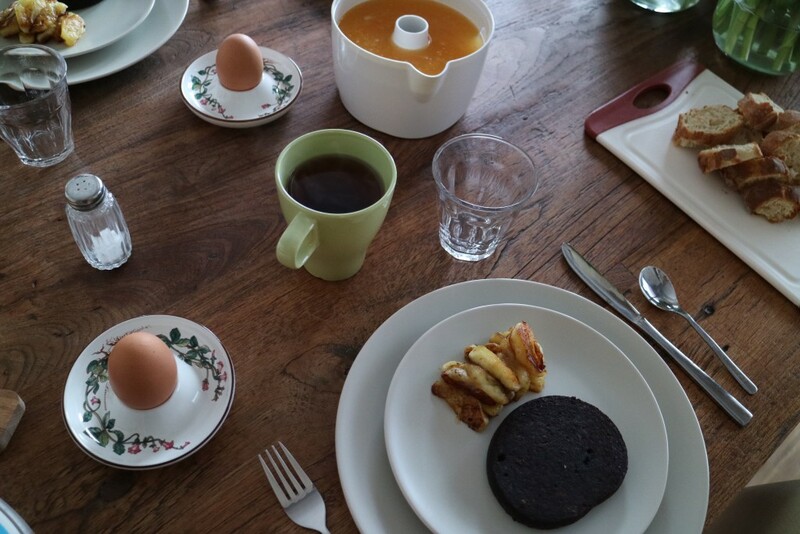 Ohhhhh, boudin noir (black pudding), pan fried with caramelised apple, for Sunday morning breakfast! I am in heaven. Delicious! 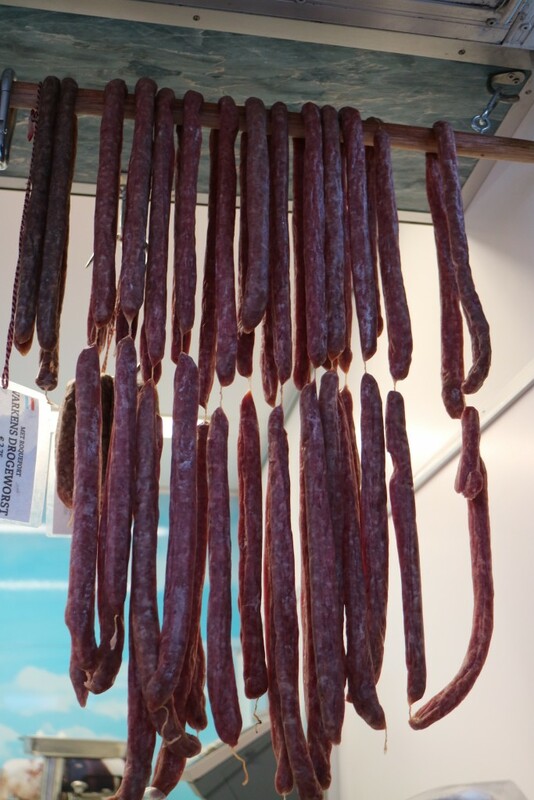 As all products on the Noordermarkt are organic, the meat is too. 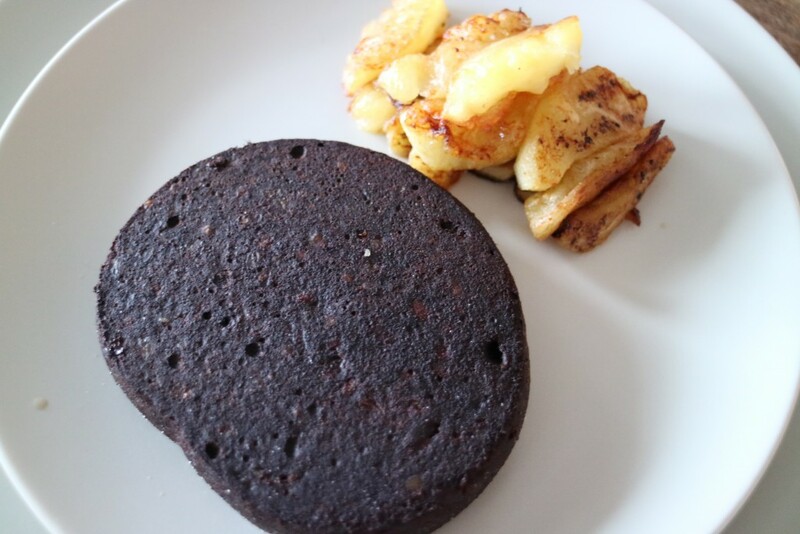 This ‘black pudding’ comes from Chris Dammers, the organic butcher from Zutphen (all the way in the Eastern part of the Netherlands), who drives his products every week to Amsterdam. 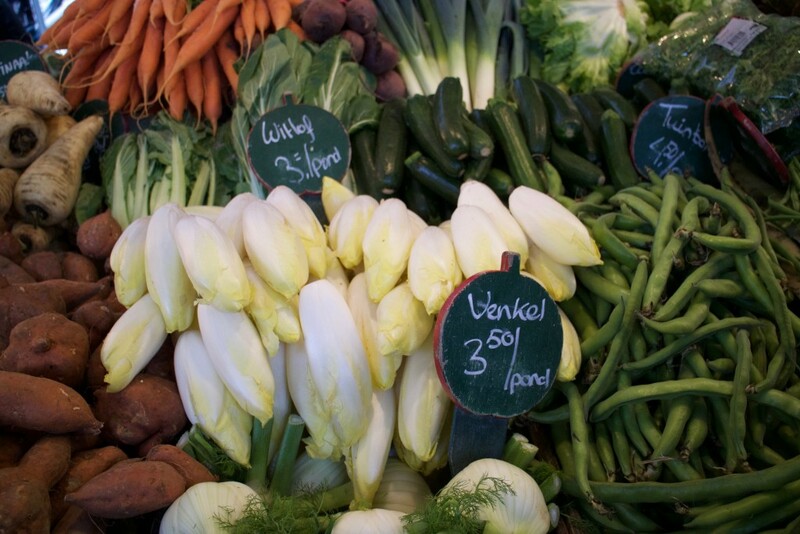 Therefore it isn’t cheap, but what you eat it real (pesticides and hormon free) and the animals had a good life. This boudin noir is the best I had in many years! 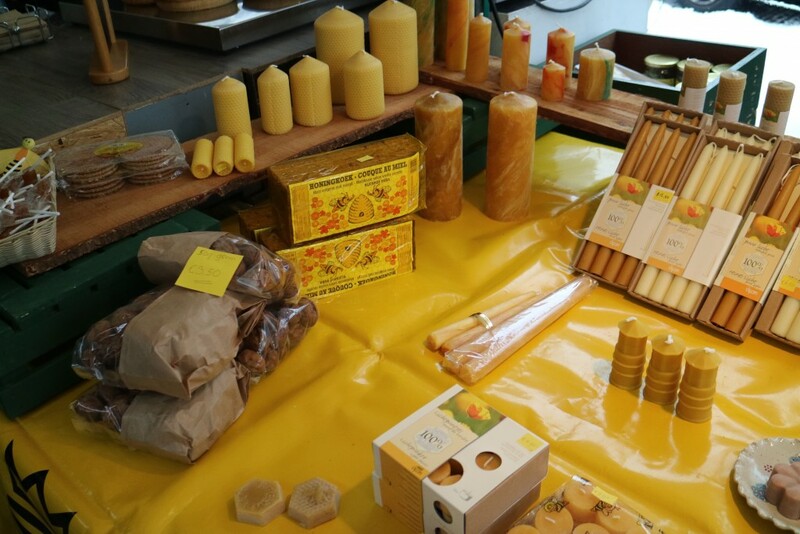 Noordermarket in Amsterdam (Jordaan neighbourhood, with her picturesque streets, cafés, restaurants and shops) is held every Saturday from 09.00 – 15.30 in front of the pretty and photogenic Noorderkerk (Noorderchurch) – click here for road directions. 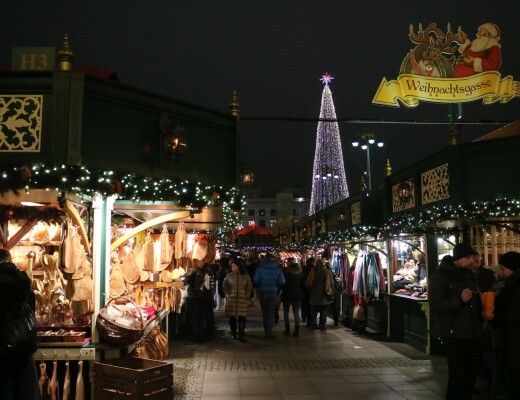 *Note: I have not been asked, paid or invited to write about Noordermarkt in Amsterdam. It was my own idea as I love to go there on Saturday morning. All images are mine, made with a Canon EOS M3 camera or an iPhone6s. Follow me on Instagram & Like my Facebook-page to stay updated!